Ma'zaddha's House is a lower-class house in the south-west region of Crucible. It is situated across the street from Sickly Bernice's Taphouse and Muurine's House. 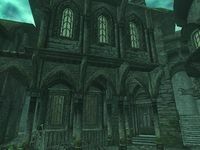 It is the sole residence of Ma'zaddha and consists of two zones: Ma'zaddha's House and Ma'zaddha's House Upstairs. The ground floor is mostly empty, the two exceptions are a bookshelf holding a copy each of An Elytra's Life, The Standing Stones, Bark and Sap, From Frog to Man, Heretical Thoughts and The Liturgy of Affliction and another shelf holding two Fungus Stalks, a Blister Pod Cap and some Grummite Eggs. The second floor isn't much better and is in a state of disarray with quite a few cobwebs hanging in the corners. The large double bed takes up most of the space and a large Sheogorath statue can be found in a corner. The cupboard in the other corner is quest-related and contains a note and further proof of the conspiracy. On a table is another copy of The Standing Stones and one of Zealotry. The nearby shelves house a rare weightless shirt with suspenders, while a copy of The Blessings of Sheogorath can be found on top. The key to the house is carried by Ma'zaddha. This page was last modified on 27 August 2018, at 08:37.